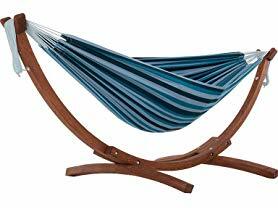 Today ONLY - Vivere Double Cotton Hammock with Stand $179.99 (Retail $239.97). The eye-catching solid wood frames sets this Double Cotton Hammock with Solid Pine Stand apart from the crowd. It is a natural choice for a rugged design aesthetic and also compliments an immaculate manicured space. The Solid Pine stand provides durability and the densely woven double cotton hammock comes in the spectactular Vivere colors that you've grown to love.